Microplastics in aquatic ecosystems and especially in the marine environment represent a pollution of increasing scientific and societal concern, thus, recently a substantial number of studies on microplastics were published. Although first steps towards a standardization of methodologies used for the detection and identification of microplastics in environmental samples are made, the comparability of data on microplastics is currently hampered by a huge variety of different methodologies, which result in the generation of data of extremely different quality and resolution. This chapter reviews the methodology presently used for assessing the concentration of microplastics in the marine environment with a focus on the most convenient techniques and approaches. After an overview of non-selective sampling approaches, sample processing and treatment in the laboratory, the reader is introduced to the currently applied techniques for the identification and quantification of microplastics. The subsequent case study on microplastics in sediment samples from the North Sea measured with focal plane array (FPA)-based micro-Fourier transform infrared (micro-FTIR) spectroscopy shows that only 1.4 % of the particles visually resembling microplastics were of synthetic polymer origin. This finding emphasizes the importance of verifying the synthetic polymer origin of potential microplastics. Thus, a burning issue concerning current microplastic research is the generation of standards that allow for the assessment of reliable data on concentrations of microscopic plastic particles and the involved polymers with analytical laboratory techniques such as micro-FTIR or micro-Raman spectroscopy. Since the middle of the 20th century, the increasing global production of plastics is accompanied by an accumulation of plastic litter in the marine environment (Barnes et al. 2009; Thompson et al. 2004). Being dispersed by currents and winds, persistent plastics, whether deliberately dumped or accidentally lost, are rarely degraded but become fragmented over time (Thompson 2015). Together with micro-sized primary plastic litter from consumer products, these degraded secondary micro-fragments lead to an increasing amount of small plastic particles, so called “microplastics” (i.e. particles <5 mm) in the oceans (Andrady 2011). Microplastics are further divided according to their size into “large microplastics” (1–5 mm) and “small microplastics” (20 µm–1 mm) (Hanke et al. 2013). The distribution of microplastics in the marine environment is strongly dependent on their density. The density of a virgin-polymer particle is often altered during the manufacturing process (e.g. density increase due to addition of inorganic fillers, density decrease due to foaming of the polymer) as well as through ageing or biofouling processes (Harrison et al. 2011; Morét-Ferguson et al. 2010; Gregory 1983). Since most synthetic polymers have a lower density than seawater, microplastic particles mostly float at the sea surface (0.022–8,654 items m−3) but occur to a lower extent suspended in the water column (0.014–12.51 items m−3). Sediments seem to represent a sink for microplastics (18,000–125,000 items m−3 in subtidal sediments) while beaches, as intermediate environments, can accumulate floating, neutrally buoyant as well as sinking plastics (185–80,000 items m−3) (Hidalgo-Ruz et al. 2012). The massive accumulation of microplastics in the oceans has been recognized by scientists and authorities worldwide, and previous studies have demonstrated the ubiquitous presence of microplastics in the marine environment (Browne et al. 2010; Hidalgo-Ruz and Thiel 2013; Ng and Obbard 2006; Claessens et al. 2011; Van Cauwenberghe et al. 2013; Vianello et al. 2013). Thus, with the Marine Strategy Framework Directive (MSFD-indicator 10.1.3) the EU prescribes a mandatory monitoring of microplastics (Zarfl et al. 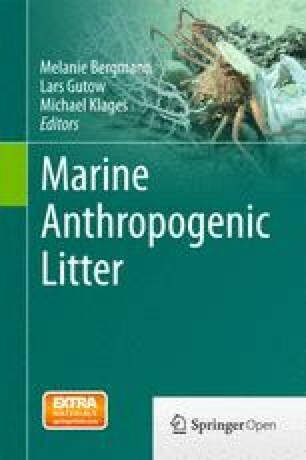 2011), and the EU Technical Subgroup on Marine Litter (TSG-ML) proposed a standardized monitoring strategy for microplastics in the EU (Hanke et al. 2013). Researchers worldwide report on the uptake of microplastics by various marine organisms (Cole et al. 2013; Ugolini et al. 2013; Foekema et al. 2013; Murray and Cowie 2011; Browne et al. 2008). Ingestion of microplastics may lead to “…potentially fatal injuries such as blockages throughout the digestive system or abrasions from sharp objects…” (Wright et al. 2013), which, in contrast to macroplastics, mainly affect microorganisms, smaller invertebrates or larvae. In addition to these physical effects on single organisms, the ecological implications can be even more severe as microplastics can release toxic additives upon degradation and accumulate persistent organic pollutants (POPs) (Bakir et al. 2012; Engler 2012; Rios et al. 2007; Teuten et al. 2009; Rochman et al. 2013). Because of their minute size, microplastics harbor the risk of entering marine food webs at low trophic levels and propagating toxic substances up the food web (Besseling et al. 2013; Mato et al. 2001). However, this is discussed controversially in the literature and several studies suggest that this issue is of minor importance from a risk assessment perspective (compare, e.g. Gouin et al. 2011; Koelmans et al. 2013, Koelmans 2015). Nevertheless, microplastics harbor the risk of transporting POPs to human food (Engler 2012). Because of their long residence time at sea plastics can travel long distances (Ebbesmeyer and Ingraham 1994) and thus function as vectors for dispersal of toxins and/or pathogenic microorganisms (Harrison et al. 2011; Zettler et al. 2013). However, although the potential risks associated with marine microplastics have recently been acknowledged the manifold impacts of microplastics on the ecosystems of the oceans have not been investigated in detail and are thus only poorly understood. Current microplastic research suffers from insufficient reliable data on concentrations of microplastics in the marine environment and on the composition of involved polymers because standard operation protocols (SOP) for microplastic sampling and detection are not available (Hidalgo-Ruz et al. 2012; Claessens et al. 2013; Imhof et al. 2012; Nuelle et al. 2014). Although first steps towards a standardization have been made, e.g. in the European Union by TSG-ML (Hanke et al. 2013), the comparability of data on microplastics is still hampered by a huge variety of different methods that lead to the generation of data of extremely different quality and resolution. In this chapter, we will critically review the methodology presently used for assessing the concentration of microplastics in the marine environment. We will focus on the most convenient techniques and approaches recently applied for the identification of microplastics. After an overview of non-selective sampling approaches and sample processing in the laboratory, we will introduce the reader to currently applied detection techniques for microplastics. Finally, we present a case study to emphasize the importance of verifying the synthetic polymer origin of potential microplastics by e.g. micro-Fourier transform infrared (micro-FTIR) spectroscopy. In an outlook, we will address important gaps in knowledge concerning the detection of microplastics and how these could be potentially filled. Today, synthetic polymers are omnipresent and daily life without plastics is inconceivable. As a consequence, even microplastic sampling, preparation and analysis procedures themselves are affected by the ubiquity of synthetic polymers in the environment. Hence, a multitude of contamination sources from sampling equipment through clothes or airborne particles can compromise the analysis of microplastics in the environment. This can lead to a great overestimation of concentrations of microplastics in samples. Because of their ability to hover in air, especially fibres have a high contamination potential and can cause problems during microplastic analysis (Hidalgo-Ruz et al. 2012; Nuelle et al. 2014; Norén 2007; Norén and Naustvoll 2010). Thus, a special focus should be laid on the prevention of contamination (Hidalgo-Ruz et al. 2012). Potential sources of contamination should be avoided by replacing plastic devices or laboratory ware by non-plastic material and the strict use of control samples is highly recommended. Analysis of control samples facilitates the identification of the source in case a contamination has occurred. Because of their relatively low concentrations in the environment sampling of microplastic particles generally requires large sample volumes. Thus, samples from the open water are usually taken with plankton nets of different mesh sizes. The sea surface is sampled for floating microplastics by manta trawls (Eriksen et al. 2013a, b; Doyle et al. 2011) or neuston nets (Morét-Ferguson et al. 2010; Carpenter and Smith 1972; Colton et al. 1974). While neuston catamarans (Fig. 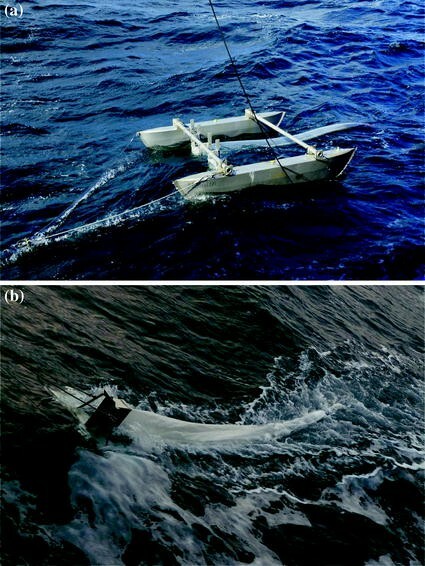 8.1a) can be operated even in higher waves, a manta trawl (Fig. 8.1b) is best used in calm waters to prevent hopping on waves and damage to the device. The volume filtered by a net is usually recorded by a flowmeter mounted at the net opening, enabling the normalization to the filtered water volume and thus a calculation of concentrations of microplastics (items/grams) per unit water volume. Relating concentrations to sampled area is also possible by multiplying trawl distance by the horizontal width of the net opening. The water column can be sampled for suspended microplastics by trawling with different plankton nets, e.g. CalCOFI (California Cooperative Oceanic Fisheries Investigations) or Bongo nets (Doyle et al. 2011). Trawling speed depends on weather conditions and currents, but usually lies between 1 and 5 knots. Trawling time depends on seston concentrations and lies between a few minutes up to several hours (Boerger et al. 2010). The plankton sample is concentrated in the cod-end of the net and after recovery the net has to be carefully rinsed from the exterior to assure that all plankton and debris are washed into the cod-end (Doyle et al. 2011). It is important to assure that no residual sample is left in the net, which would lead to a carryover of microplastics to the next sample. The content of the codend is finally transferred to a sample container and fixed with plastic friendly fixatives (e.g. formalin) or stored frozen. If the particles are directly sorted they should be dried and kept in the dark until further analysis (Hidalgo-Ruz et al. 2012). The size of the particles retained and also the filterable volume is a direct consequence of the mesh size used. The mesh sizes used for sampling in previous studies varied between 50 and 3000 µm (Hidalgo-Ruz et al. 2012). Another factor influencing the filtered volume is the net size, i.e. the area, which acts as filter. Depending on the seston concentration in the water, a few thousand litres to several hundred cubic metres can be filtered until a net becomes clogged. Seasons with red tides or plankton and jellyfish blooms are generally unfavorable for sampling large volumes of water. Nets are usually 3–4.5 m long and a mesh size of around 300 µm is most commonly used. These nets do not sample microplastic particles <300 µm quantitatively but allow for sampling of larger volumes of water. In order to avoid the risk of clogging nets at small mesh sizes, only few studies used mesh sizes <300 µm. The non-standardized use of different nets and mesh sizes seriously impedes the comparability of data sets on pelagic microplastic concentrations. Besides common net sampling, other techniques are occasionally used for assessing microplastic concentrations in the water column: bulk sampling with subsequent filtration (Ng and Obbard 2006; Dubaish and Liebezeit 2013), screening Continuous Plankton Recorder (CPR) samples (Thompson et al. 2004) or using direct in situ filtration (Norén and Naustvoll 2010). A highly promising technique, currently under development, is the use of direct fractionated pressure filtering of large (>1 m3) volumes of water through a filter cascade (developed by -4H-JENA engineering GmbH). This approach theoretically allows for the simultaneous sampling of different size fractions of microplastics down to <10 µm and thus enables a more comprehensive resolution of the size spectrum of microplastics. Microplastics in sediments or beaches are currently more frequently analyzed than microplastics in the water column (Hidalgo-Ruz et al. 2012). Sampling approaches depend on the sampling location i.e. sampling sediments directly on beaches or sampling subtidal sediments from a ship. Sampling beaches for microplastics is relatively easy and requires nothing more than a non-plastic sampling tool (tablespoon, trowel or small shovel), a frame or a corer to specify the sampling area and a container (if possible non-plastic) to store the sample. The quantity of samples reported in the literature varies between less than 500 g to up to 10 kg (Hidalgo-Ruz et al. 2012). While sampling on a beach poses no problem per se, the positioning of the sample location on the beach is still a matter of scientific debate as the distribution of microplastic particles is as dynamic as the beach itself (Hidalgo-Ruz et al. 2012). The high-tide line where flotsam accumulates is sampled mostly (Browne et al. 2010). Commonly applied sampling strategies include random sampling at several locations on the beach, on transects perpendicular or parallel to the water or in single squares. Often, several samples are pooled for an integrated estimate of the microplastic contamination of a beach. Every single sampling location for the pooled sample is then defined as described above. Another point of concern is the sampling depth. Sampling the top five centimetres is a common approach (as also suggested by the TSG-ML), but sampling to a depth of 0.3 m is also reported in the literature (Claessens et al. 2011). If corers are used for sampling, different depth layers can be sampled so that microplastic concentrations can be related to sediment depth and eventually to the age of the corresponding sediment layer. The units of microplastic abundance reported depend on the sampling approach. Thus, abundance is normalized to sampling area, sediment weight or volume. Sampling sediments for microplastics at beaches might appear trivial. However, currently no standard protocol exists for sampling microplastics with respect to location, sampling technique and sample quantity, and thus the comparability of the data produced is limited. Accordingly, there is an urgent need for the development of standardized sampling approaches. Because of the patchy distribution of microplastics at beaches a standardized, spatially integrating sampling design appears reasonable and would facilitate the generation of comparable data. A first step towards the standardization of sampling microplastics at beaches in the EU has been made by the TSG-ML (Hanke et al. 2013). They recommend to monitor microplastics at sandy beaches at the strandline with a minimum of five replicate samples separated by at least five metres and to distinguish two size categories: large microplastics (1–5 mm) and small microplastics (20 µm–1 mm). Small microplastics should be sampled from the top five centimetres with a metal spoon by combining several scoops at arm length in an arc-shaped area at the strand line to collect ca. 250 g of sediment; large microplastics should be sampled from the top five centimetres and several kilograms of sediment sample can be reduced by sieving over a 1-mm sieve directly at the beach. Subtidal sediments can be sampled from vessels with grabs, e.g. Van Veen or Ekman grab or corers of different design, e.g. a multiple corer. Grabs tend to disturb the sediment and are suited for surface (e.g. top five centimetres) or bulk sampling, whereas undisturbed core samples enable the simultaneous sampling of surface and depth layers but yield smaller sample volumes. The size of the instrument applied as well as the time needed for its retrieval depends strongly on the water depth at the sampling location. The use of corers enables sampling to a water depth of more than 5,000 m (Van Cauwenberghe et al. 2013). Sediment samples are usually stored frozen or dried and kept in the dark until further analysis. The ingestion of microplastics by various marine vertebrates and invertebrates under laboratory conditions and in the field has been reported in the literature (Lusher 2015). As sampling strategies are variable and depend strongly on the organism targeted we give only a short overview of possible sample organisms for the ingestion of microplastics with a focus on field sampling. For a detailed review please refer to Wright et al. 2013 and Ivar do Sul and Costa 2013. Laboratory studies on the ingestion of microplastics by marine biota frequently use microscopic plastic beads of known polymer origin, which can be easily recognized and counted under the microscope in gut contents and excretions or—in the case of transparent planktonic organisms—in the organism itself (Cole et al. 2013). In this context, the use of fluorescent particles facilitates the recovery and enumeration of the particles. Investigations on the ingestion of microplastics by vertebrates in the field require a substantially higher effort and thus studies in this area of research are rare (Wright et al. 2013). The target for sampling is the content of the digestive tract or the excretions of an organism. Larger organisms that are directly sampled for microplastics are mainly fish, which are usually sampled by nets or traps. Stranded carcasses (e.g. birds, seals, cetaceans) can be collected and examined for ingested microplastics. This has been done for stranded northern fulmars (Fulmarus glacialis) in the North Sea for more than three decades (Wright et al. 2013; Kühn et al. 2015). After dissection, the gut content or the entire digestive tract has to be conserved or frozen for later analysis. Another possibility used for the sampling of mammals and birds is to “indirectly” sample organisms for the ingestion of microplastics by collecting their boluses, casts or faeces. Bond and Lavers (2013) used emetics to monitor plastic ingestion in storm-petrel chicks (Oceanodroma leucorhoa) enabling the authors to study plastic ingestion non-lethally. Smaller invertebrate organisms such as worms, mussels and snails can be directly collected in the field (Besseling et al. 2013; Claessens et al. 2013) with nets or traps and are best frozen as a whole until analyzed. Biological samples can be conserved by using plastic-friendly fixatives (e.g. formalin) or best be frozen or dried and kept dark until analysis. The densities of common consumer-plastic polymers range between 0.8 (silicone) and 1.4 g cm−3 (e.g. polyethylene terephthalate (PET), polyvinyl chloride (PVC)) while expanded plastic foams have only a fraction of the densities of the original polymer (e.g. expanded polystyrene (EPS) <0.05 g cm−3). Microplastic particles can thus be separated from matrices with higher densities, such as sediments (2.65 g cm−3), by flotation with saturated salt solutions of high density. The dried sediment sample is mixed with the concentrated salt solution and agitated (e.g. by stirring, shaking, aeration) for a certain amount of time. Plastic particles float to the surface or stay in suspension while heavy particles such as sand grains settle quickly. Subsequently, microplastics are recovered by removing the supernatant. Depending on the solution used, different fractions of the range of consumer polymers are targeted—the higher the density of the solution the more polymer types can be extracted. Often a saturated NaCl solution is used for the extraction of microplastics (Thompson et al. 2004; Browne et al. 2010; Ng and Obbard 2006; Claessens et al. 2011; Browne et al. 2011). Although being an inexpensive and environment-friendly approach, not all common polymers are extracted (e.g. PVC, PET, polycarbonate (PC), polyurethane (PUR)) because of the relatively low density of the solution (~1.2 g cm−3). Other solutions used include sodium polytungstate solution (1.4 g cm−3) (Corcoran et al. 2009), zinc chloride solution (1.5–1.7 g cm−3) (Imhof et al. 2012; Liebezeit and Dubaish 2012) or sodium iodine solution (1.8 g cm−3) (Nuelle et al. 2014). These high-density solutions are suitable for the extraction of most of the common user plastics. For financial/environmental reasons the use of zinc chloride and the recycling of the saturated solution by pressure filtration is highly recommended. There is great variability in the extraction techniques applied. The approaches range from simply stirring the sediment sample in a saturated salt solution (classical setup) (Thompson et al. 2004; Claessens et al. 2011) to the use of an elutriation/fluidisation with subsequent flotation (Claessens et al. 2013; Nuelle et al. 2014) or the extraction with a novel instrument, the “Microplastic Sediment Separator” (MPSS) (Imhof et al. 2012). The extraction efficiencies vary between the techniques used but also depend on the particle shape, size and the polymer origin of the model particles used during recovery experiments. The classic extraction setup reaches recoveries of 80–100 % (Fries et al. 2013) but recovers small microplastics insufficiently (mean recovery rate 40 %, mean particle size 40–309 µm) (Imhof et al. 2012), whereas new approaches achieve high recovery rates of 68–99 % (Nuelle et al. 2014), 96–100 % (Imhof et al. 2012) and 98–100 % (Claessens et al. 2013). Small particles (<500 µm) are more difficult to extract from sediments. Therefore, time-consuming repeated extraction steps are recommended to maximize recovery (Claessens et al. 2013; Nuelle et al. 2014; Browne et al. 2011). Only the MPSS showed a recovery rate of 96 % for small microplastics in a single extraction step (Imhof et al. 2012). Irrespective of the technique used for later identification of microplastics the fractionation of samples (water, sediment, biota) into (at least) two size classes, e.g. >500 µm and <500 µm, is reasonable (Hidalgo-Ruz et al. 2012). For EU monitoring purposes, a separation into fractions of 1–5 mm and 20 µm–1 mm was recently suggested (Hanke et al. 2013). Water samples can be fractionated easily by sieving. If large amounts of biological matrix (e.g. gut contents, tissue, large plankton) clog the sieve a purification step prior to sieving can be helpful. Microplastics from sediment samples are easily size-fractionated after extraction. If the sediment sample matrix consists mainly of smaller grains (<500 µm) it can be sieved after drying (or wet) to reduce the volume for later extraction. In this case, the sample must be handled with care during sieving to avoid the mechanical generation of additional microplastic particles from larger, brittle plastic material. A 500 µm sieve, ideally made of steel, can be used for size separation. The use of a sieve cascade of different mesh sizes allows for size separation and quantification of different size classes of microplastics (Moore et al. 2002; McDermid and McMullen 2004). Microplastic particles >500 µm can be sorted out manually under a stereomicroscope using forceps and subsequently analyzed (visually, spectroscopically, other techniques). The effort involved in the manual sorting of particles increases for the fraction <500 µm owing to difficulties in handling small particles. Furthermore, an increasing amount of background matrix particles of different organic or inorganic origin may impede a proper separation. Therefore, this fraction should be purified and concentrated on filters for further analysis by, e.g. spectroscopy. The suggested size separation (>500 µm; <500 µm) is accounted for by the techniques that can be used for later identification. Additionally, the standardized application of size fractionation enables an inter-comparison between different studies, at least for the larger fraction, even if the smaller fraction is not of interest for the study (Hidalgo-Ruz et al. 2012). The purification of microplastic samples is obligatory, especially, for instrumental analyses (FTIR/Raman spectroscopy, pyrolysis-GC/MS). Biofilms and other organic and inorganic adherents have to be removed from the microplastic particles to avoid artifacts that impede a proper identification. Furthermore, the purification step is necessary to minimize the non-plastic filter residue on filters on which the microplastic fraction <500 µm is concentrated. The most gentle way to clean plastic samples is stirring and rinsing with freshwater (McDermid and McMullen 2004). The use of ultrasonic cleaning (Cooper and Corcoran 2010) should be carefully considered because aged and brittle plastic material might break during treatment resulting in the artificial generation of secondary microplastics (Löder and Gerdts, personal observation). A treatment with 30 % hydrogen peroxide of the dried sediment sample (Liebezeit and Dubaish 2012), the sample filter (Imhof et al. 2012; Nuelle et al. 2014) or the microplastic particles themselves removes large amounts of natural organic debris. Andrady (2011) suggests the use of mineral acids to disintegrate organic impurities in samples. For the digestion of the soft tissue of biotic samples Claessens et al. (2013) used either acid, base and oxidizer (hydrogen peroxide) or a specific mixture thereof. Hot acid digestion with HNO3 resulted in the best purification results (Claessens et al. 2013). However, several plastic polymers (e.g. polyamide, polyoxymethylene, polycarbonate) react to strong acidic or alkaline solutions (Claessens et al. 2013; Liebezeit and Dubaish 2012), which limits the applicability of these reagents. More promising is the use of a sequential enzymatic digestion as a plastic-friendly purification step. A first attempt of enzymatic purification of samples has been made by Cole et al. (2014) who used only a single enzymatic step (proteinase-K). Sample purification with different technical enzymes (lipase, amylase, proteinase, chitinase, cellulase) prior to micro-FTIR spectroscopy has successfully been applied by our group. This approach reduces the biological matrix of plankton and sediment samples (including chitin, which is present especially in marine samples) as well as the matrix of biological tissue samples to a minimum and thus proved to be a very valuable technique to minimize matrix artifacts during FTIR measurements (Löder and Gerdts, unpublished data). According to Hidalgo-Ruz et al. (2012) visual sorting to separate potential microplastics from other organic or inorganic material in the sample residues is an obligatory step for the identification of microplastics. If large microplastics are the target of a study this can be done by visual inspection (Morét-Ferguson et al. 2010) whereas smaller microplastic particles should generally be sorted out under a dissection microscope (Doyle et al. 2011). Sorting of aqueous samples can be facilitated by the use of sorting chambers (e.g. Bogorov counting chamber). Generally, if no more accurate methods (e.g. FTIR or Raman spectroscopy) are used to verify synthetic polymer origin of potential microplastic particles the visual identification should not be applied to particles <500 µm as the probability of a misidentification is very high. Hidalgo-Ruz et al. (2012) thus suggest an even higher size limit of 1 mm for visual identification. According to Norén (2007), selection of particles according to standardized criteria in connection with a strict and conservative examination reduces the possibility of misidentification. He suggests the following criteria: (1) no structures of organic origin should be visible in the plastic particle or fibre, (2) fibres should be equally thick and have a three-dimensional bending to exclude a biological origin, (3) particles should be clear and homogeneously colored, (4) transparent or whitish particles must be examined under high magnification and with the help of fluorescence microscopy to exclude a biological origin (Norén 2007). General aspects that are used to describe visually sorted microplastics are source, type, shape, degradation stage, and color of the particles (Hidalgo-Ruz et al. 2012). It is strongly recommended to subsequently analyze sorted particles by techniques that facilitate a proper identification of plastics (Hidalgo-Ruz et al. 2012; Dekiff et al. 2014) because the quality of the data produced by visual sorting depends strongly on (1) the counting person, (2) the quality and magnification of the microscope and (3) the sample matrix (e.g. plankton, sediment, gut content). Another fundamental drawback of visual sorting is the size limitation, i.e. particles below a certain size cannot be discriminated visually from other material or be sorted because they are unmanageable because of their minuteness. Furthermore, visual sorting is extremely time-consuming. In summary, even an experienced person cannot discriminate all potential microplastic particles unambiguously from sand grains, chitin fragments, diatom frustule fragments, etc. Thus the error rate of visual sorting reported in the literature ranges from 20 % (Eriksen et al. 2013a) to 70 % (Hidalgo-Ruz et al. 2012) and increases with decreasing particle size. The repetitive fingerprint-like molecular composition of plastic polymers allows for a clear assignment of a sample to a certain polymer origin. In the following we will give a short overview of methods applied for polymer identification with a focus on the nowadays frequently used FTIR and Raman analyses of microplastics. Morét-Ferguson et al. (2010) used the specific densities of particles to identify the polymer origin of visually sorted microplastics. For this purpose, the sample was placed in distilled water and, depending on the density of the sample, either ethanol or concentrated solutions of calcium or strontium chloride were added until the sample was neutrally buoyant. The density of the particle was indirectly assessed by weighing a certain volume of the solution. This facilitated the determination of the density with high precision. Different groups of polymers possess a characteristic elemental composition, which was used to identify the plastic origin of a particle by a subsequent C:H:N analysis. By comparison with the densities and C:H:N ratios of virgin-polymer samples the particle could be assessed as either plastic or not and assigned to a group of potential polymers (Morét-Ferguson et al. 2010). This approach represents an approximation to the identification of microplastic particles by narrowing the search for the potential polymer type but not a rigorous chemical analysis. Further drawbacks are the relatively high time effort, which hampers a high sample throughput and that this technique is not applicable to smaller particles. Pyrolysis-gaschromatography (GC) in combination with mass spectrometry (MS) can be used to assess the chemical composition of potential microplastic particles by analyzing their thermal degradation products (Fries et al. 2013). The pyrolysis of plastic polymers results in characteristic pyrograms, which facilitate an identification of the polymer type. This analytical approach is already used after extraction and visual sorting of microplastics from sediments. The polymer origin of particles is then identified by comparing their characteristic combustion products with reference pyrograms of known virgin-polymer samples (Nuelle et al. 2014; Fries et al. 2013). If a thermal desorption step precedes the final pyrolysis organic plastic additives can be analyzed simultaneously during pyrolysis-GC/MS runs (Fries et al. 2013). Although the pyrolysis-GC/MS approach allows for a relatively good assignment of potential microplastics to polymer type it has the disadvantage that particles have to be manually placed into the pyrolysis tube. Since only particles of a certain minimum size can be manipulated manually this results in a lower size limitation of particles that can be analyzed. Furthermore, the technique allows only for the analysis of one particle per run and is thus not suitable for processing large sample quantities, which are collected during sampling campaigns or routine monitoring programs. However, currently promising pyrolysis-GC/MS approaches for the qualitative/quantitative analysis of microplastics on whole environmental sample filters are being developed (Scholz-Böttcher, personal communication). Raman spectroscopy is a straightforward technique that has been successfully used to identify microplastic particles in different environmental samples with high reliability (Van Cauwenberghe et al. 2013; Cole et al. 2013; Murray and Cowie 2011; Imhof et al. 2012, 2013). During the analysis with Raman spectroscopy the sample is irradiated with a monochromatic laser source. The laser depends on the system used: available laser wavelengths usually range between 500 and 800 nm. The interaction of the laser light with the molecules and atoms of the sample (vibrational, rotational, and other low-frequency interactions) results in differences in the frequency of the backscattered light when compared to the irradiating laser frequency. This so-called Raman shift can be detected and leads to substance-specific Raman spectra. Since plastic polymers possess characteristic Raman spectra the technique can be applied to identify plastic polymers within minutes by comparison with reference spectra. Raman spectroscopy is a “surface technique”, thus large, visually sorted microplastic particles can be analyzed and the technique can also be coupled with microscopy. Accordingly, micro-Raman spectroscopy allows for the identification of a broad range of size classes down to very small plastic particles of sizes below 1 µm (Cole et al. 2013). If Raman microscopy is combined with Raman spectral imaging it is possible to generate spatial chemical images based on the Raman spectra of a sample. Micro-Raman imaging theoretically allows for the spectral analysis of whole membrane filters at a spatial resolution below 1 µm. This would facilitate the detection of even the smallest microplastic particles in environmental samples, but the applicability for microplastic research has yet to be demonstrated. Raman spectroscopy can also be coupled with confocal laser-scanning microscopy to locate polymer particles within biological tissues with subcellular precision (Cole et al. 2013). One drawback of Raman spectroscopy is that fluorescent samples excited by the laser (e.g. residues of biological origin from samples) cannot be measured as they prevent the generation of interpretable Raman spectra. Generally, lower laser wave lengths, which transfer a high energy result in high signal intensity but also in a high fluorescence. The fluorescence can be minimized by using lasers with higher wave lengths (>1,000 nm). However, the lower energy of the laser results in a lower signal of the polymer sample. More research is necessary to find the optimum laser wave length for a compromise between suppressed fluorescence and low signal intensity for assessments of microplastics in environmental samples. Generally, a purification step of samples to prevent fluorescence is thus recommended prior to measurements for a clear identification of the polymer type of microplastic particles with Raman spectroscopy. Similar to Raman spectroscopy, infrared (IR) or Fourier-transform infrared (FTIR) spectroscopy offers the possibility of accurate identification of plastic polymer particles according to their characteristic IR spectra (Thompson et al. 2004; Ng and Obbard 2006; Vianello et al. 2013; Harrison et al. 2012; Frias et al. 2010; Reddy et al. 2006). FTIR and Raman spectroscopy are complementary techniques. Molecular vibrations, which are Raman inactive are IR active and vice versa and can thus provide complementary information on microplastic samples. IR spectroscopy takes advantage of the fact that infrared radiation excites molecular vibrations when interacting with a sample. The excitable vibrations depend on the composition and molecular structure of a substance and are wave-length specific. The energy of the IR radiation that excites a specific vibration will—depending on the wave length—be absorbed to a certain amount, which enables the measurement of characteristic IR spectra. Plastic polymers possess highly specific IR spectra with distinct band patterns making IR spectroscopy an optimal technique for the identification of microplastics (Hidalgo-Ruz et al. 2012). FTIR spectroscopy can provide further information on physico-chemical weathering of sampled plastic particles by detecting the intensity of oxidation (Corcoran et al. 2009). As for Raman spectroscopy the comparison with reference spectra is necessary for polymer identification. Large particles can be easily analyzed by an FTIR surface technique—“attenuated total reflectance” (ATR) FTIR spectroscopy—at high accuracy in less than one minute. A step forward with respect to the characterization of small-sized particles is the application of FTIR microscopy. In this context, the use of two measuring modes is feasible: reflectance and transmittance. The reflectance mode bears the disadvantage that measurements of irregularly-shaped microplastics may result in non-interpretable spectra due to refractive error (Harrison et al. 2012). The transmittance mode needs IR transparent filters (e.g. aluminium oxide) and is, owing to total absorption patterns, limited by a certain thickness of the microplastics sample. However, the additional use of micro-ATR objectives in combination with microscopy can circumvent this as IR spectra are collected at the surface of a particle enabling the direct measurement on the sample filter without the need for manual handling of particles. Thus, an approach combining transmittance measurements with micro-ATR measurement of particles that show total absorption could be a promising solution for the measurement of particles <500 µm collected on filters. Although micro-FTIR mapping, i.e. the sequential measurement of IR spectra at spatially separated, user-defined points on the sample surface, has been successfully applied for microplastics identification (Levin and Bhargava 2005) this technique is still extremely time-consuming when targeting the whole sample filter surface at a high spatial resolution because it uses only a single detector element (Vianello et al. 2013; Harrison et al. 2012). Harrison et al. (2012) concluded that a highly promising FTIR extension, focal plane array (FPA)-based FTIR imaging (Levin and Bhargava 2005), allows for detailed and unbiased high throughput analysis of total microplastics on a sample filter. This technique enables the simultaneous recording of several thousand spectra within an area with a single measurement and thus the generation of chemical images (see the below case study for a successful application of this technique by Löder and Gerdts). By combining FPA fields, whole sample filters can be analyzed via FTIR imaging. It should be noted, that the lateral resolution of micro-FTIR spectroscopy is diffraction limited (e.g. 10 µm at 1000 cm−1) and, in contrast to Raman spectroscopy, samples must be dried prior to measurement via IR spectroscopy as water strongly absorbs IR radiation. Because of their high IR absorption the IR measurement of black particles is difficult. As for Raman measurements, samples should be purified for proper identification of the polymer type of microplastic particles by IR spectroscopy. The aim of the case study was to evaluate the applicability of FPA-based micro-FTIR imaging for the measurement of microplastic particles in environmental samples. We tested this technique on particles, which were purified and pre-extracted from sediment samples. All steps preceding the micro-FTIR analysis (sampling, preparation, counting etc.) were done by the Lower Saxony Water Management, Coastal Defense and Nature Conservation Agency (NLWKN) or its contractors, which provided the samples. During a large-scale microplastics baseline assessment of the NLWKN, North Sea sediments were sampled at 101 stations along the German coast of Lower Saxony and on the East Frisian Islands between November 2011 and March 2012. Seventy-three stations were sampled on the islands of Baltrum, Juist, Kachelotplate, Mellum, Minsener Oog and Spiekeroog. On the islands, samples were taken in transects with five sub-samples at each station from the low-water line towards the vegetation zone of the first dune. Sixteen eulittoral samples were taken in the back-barrier tidal flat of Norderney and Spiekeroog and the tidal-flats “Hoher Weg” and “Wurster Watt”. Twelve sublittoral samples were taken on north-south transects at depths of 5, 10 and 20 m off the islands Baltrum, Juist and Spiekeroog and at one station in a tidal inlet in the back-barrier tidal flat of each island. Beach and eulittoral samples were obtained at the onshore stations by sampling of five replicate areas of 10 × 10 cm within 1 m2 down to a depth of 1 cm using a metal frame of the abovementioned dimensions. Sublittoral samples at the offshore stations were obtained by a van Veen grab and the recovered material was also sampled on an area of 10 × 10 cm and down to 1 cm depth. Five grab samples were taken at each sublittoral station. No plastic equipment was used during sampling and all samples were stored in aluminium foil until further processing. After drying at 60 °C the samples were screened over a 500 µm metal sieve as suggested by Hidalgo-Ruz et al. (2012) to obtain two size fractions of microplastics. The fraction >500 µm was stored and not considered further in this study. The material passing through the sieve was homogenized and analyzed. For the extraction of microplastics 10 g of each sediment sample were treated with 50 ml 30 % hydrogen peroxide overnight to remove natural organic material. After a second drying step, microplastic particles were extracted via density separation in zinc chloride solution (1.5 g cm−3) in a 100-ml glass beaker. After stirring the sample was treated in an ultrasonic bath for 15 min and the beaker kept covered overnight for the sedimentation of sand particles. Potential microplastic particles that accumulated at the surface of the zinc chloride solution were sampled with a syringe and finally filtered onto gray, pre-washed cellulose nitrate filters with a pore size of 1.2 µm and a grid of 3.1 mm. The filters were dried for further analysis. The pre-washed filters were weighed to obtain the amount of potential microplastics per 10 g sediment sample. Particles were counted under the bright-field microscope at 20–80-fold magnifications differentiating visually between granular/spherical microplastics, fragments and fibrous microplastics. After analysis, the material on the filters was gently transferred into small glass vials for storage prior to FTIR analyses. Large numbers of particles, especially granular material, were detected when counting the material on the filters. Since a solely optical classification does not enable a reliable identification of particles as microplastics, the NLWKN selected ten samples (beach, eulittoral and sublittoral samples, for details see Table 8.1) for FTIR analysis to determine the polymer origin and composition of the microplastic particles in the samples. Each complete microplastic sample or a subsample thereof as large as possible was carefully transferred to a circular calcium fluoride crystal sample carrier (13 mm diameter, 1 mm thickness) for FTIR analysis. The objective of the FTIR analyses was to identify the polymer origin of at least 20 particles of each of the aforementioned classification types (spherical-granular, fragments and fibres) distinguished during previous counting. Prior to the FTIR measurements, a microscopic overview picture (40-fold magnification; bright-field) of each sample was taken to identify sample regions with conspicuous particles (Fig. 8.2). Because of the general scarcity of fragments and fibres and the high abundance of granular particles, areas with those rare particle types present were selected. Thus the measurements were not random. Black particles showed hardly interpretable IR spectra because of their high absorption of IR radiation and were, thus, not given priority during the measurements. FTIR spectra of particles were recorded using a Bruker HYPERION 3000 FTIR microscope equipped with a liquid nitrogen cooled 64 × 64 detector elements focal plane array detector (FPA) with a 15 × IR objective. The microscope was coupled with a TENSOR 27 spectrometer. IR spectra were recorded in transmission mode as average spectra by calculating the arithmetic mean of 32 scans in the range 3850–900 cm−1 with a resolution of 4 cm−1 and a 6 mm aperture. Depending on the amount of regions with conspicuous particles, between 20 and 65 FPA fields were measured per sample after manual focusing of the microscope. A single FPA field covered an area of 170 × 170 µm with a lateral pixel resolution of 2.7 µm (Bruker Optics) and ca. 40 s were needed for a measurement. Background measurements were performed on the blank sample carrier prior to each sample measurement. The measurements were processed with the software “OPUS 7.0” (Bruker Optics). The polymer origin of particles was identified by comparison with a self-generated polymer library in OPUS 7.0. For creating this library, we measured (ATR-FTIR) pre-production plastic pellets, powders and films of the most commonly used consumer-plastic polymers provided by different plastic polymer manufacturers. Currently, the library consists of 128 plastic polymer records and several other marine abiotic and biotic materials (e.g. cellulose, quartz, chitin, silicate, keratin) and will be expanded in the future. Between 29 and 64 particles per sample were analyzed by FTIR microscopy resulting in a total number of 404 particles analyzed from the ten samples provided by the NLWKN. Only 16 particles (12 fragments and 4 fibres), i.e. 4 % of the total number of investigated particles, differed in their shape from the abundant granular material. With 388 counts the majority (96 %) of the particles could clearly be assigned to the category of granular particles. Most of the granular particles were transparent to whitish-opaque and between 100 and 300 µm in size (Fig. 8.2). Of these, 320 particles showed a spectrum that strongly differed from common polymer IR spectra. By comparison with the IR spectrum of laboratory quartz (p.a. grade, Merck) we were able to show, that all these particles were in fact quartz sand and not microplastics (Fig. 8.3). 68 further granular particles that were very similar in shape and appearance to the quartz particles also displayed non-polymer spectra. These spectra were similar to the quartz spectra (Fig. 8.4) and were thus certainly also of mineral origin. However, because of the lack of reference spectra a definite identification was not possible in those cases. Within the 16 particles that differed from the granular material, we found four black malleable fragments with a size between 260 and 390 µm, which exhibited high absorbance and showed non-interpretable transmission IR spectra (Fig. 8.5). According to their bitumen-like, malleable properties and coloration, those particles are most likely oil residues from ship spillages or road wear. In total, six particles were of biological origin. Four particles of fibrous appearance (length: 290–900 µm, width 16–100 µm) showed organic IR spectra similar to cellulose and were most likely of plant origin. Two particles (200–800 µm) exhibited chitin-like IR spectra and were thus assigned to particles of animal origin. Within the differentially shaped particles, only six fragments (i.e. 1.4 %) of the analyzed particles, displayed a plastic polymer spectrum. Three fragment-shaped particles in the size between 440–1200 µm were polystyrene and another three fragments between 180–450 µm were polyethylene (Fig. 8.6). With the help of chemical imaging the localization of characteristic spectra within the measured area could be visualized accurately and the microplastic particles could be identified (Fig. 8.7). As a consequence of the applied sample extraction and purification techniques, it was assumed that the provided samples should have comprised mainly microplastic fragments and other organic material of low density. However, plastic fragments were exceptionally rare as they made up only 1.4 % of all analyzed particles. Since we manually screened the bright-field microscopic images for areas with heterogeneous particle appearance and measured at these locations, it can be assumed, that in total, the abundance of microplastics in the samples was even lower. Surprisingly, the majority of particles could be clearly identified as quartz particles, although these should have been excluded via the density separation step. While it remains to be clarified why the samples contained such large amounts of sand grains, the case study proves the absolute necessity of spectroscopic (e.g. FTIR) measurements for microplastics analysis. In this context FPA-based micro-FTIR spectroscopy proved to be a very promising technique for verifying polymer origin of microplastic particles and thus should be mandatorily included in future monitoring programs on microplastics after SOPs for the purification and measurement approaches have been established. Currently, the reliability and comparability of data on marine microplastic concentrations is hampered by the huge variety of different methodologies applied, which lead to the generation of data of extremely different quality (Hidalgo-Ruz et al. 2012). Thus, one basic aim must be the standardization of methodologies for identification and quantification of microplastics in the marine environment and the subsequent formulation of standard operating procedures (SOPs). This involves the whole cycle of the assessment of microplastics in environmental samples from sampling procedures to sample purification and identification of microplastic particles. More research is needed in the field of representative sampling designs, especially when it comes to sampling sediments on beaches. Although sampling in itself is no challenge, choosing the appropriate sampling locations and number of replicates to representatively describe the plastic contamination of a highly dynamic environment such as a beach is indeed challenging. The suggestions by the TSG-ML (Hanke et al. 2013) are first steps towards a standardization of beach sampling within the microplastics monitoring programs of the member states of the EU. Depending on the mesh size used, plankton or neuston nets allow for adequate sampling of a certain size class of microplastics from the water column or from surface waters. However, since nets can easily clog, especially the biologically important fraction of particles <100 µm is often severely underrepresented. Sequential size fractionated filtering of large volumes of water is a very promising technique that could provide a remedy for this problem although the applicability has yet to be proven in the field. Techniques for sampling microplastics in biological material are as variable as the biota themselves and thus a general standardization cannot be achieved. For the monitoring of microplastics in single species, such as the northern fulmar, long-term observations could lead to the establishment of standardized sampling procedures. Sample preparation should involve a size fractionation of particles larger and smaller than 500 µm as suggested by Hidalgo-Ruz et al. (2012) (alternatively 1000 µm, TSG-ML, Hanke et al. 2013) to enable comparability of data from different studies including studies that focus on particles <500 µm. Currently, no SOP exists for extraction solutions and techniques used to extract microplastic particles from samples. The use of extraction solutions of lower densities (e.g. NaCl) results in underestimation of microplastics of higher densities. Zinc chloride is a relatively cheap and recyclable solution that can be used to produce high-density solutions, which extract the whole spectrum of common user plastics. Furthermore, we suggest using separation techniques with high recovery rates in the whole size spectrum of microplastic particles at low temporal and personal effort such as the Microplastic Sediment Separator (Imhof et al. 2012). Identification by spectroscopy is essential, especially for particles <500 µm. The quality of the spectroscopic results relies strongly on effective sample purification. Purifying steps with agents that negatively affect certain plastic polymers (e.g. strong acidic or alkaline solutions) should be avoided to conserve the whole spectrum of plastic contamination within an environmental sample. Gentle approaches such as sequential enzymatic digestion have been successfully applied by the authors and provide efficient purification for subsequent spectroscopic analysis. The contamination of microplastic samples during the whole assessment procedure from sampling to analysis is a highly urgent topic that needs to be addressed by standardised contamination prevention techniques. In this context, the avoidance of plastic material as far as possible as well as the use of control samples should be implemented as key elements of microplastics investigations. An example of recent research by the authors showed that the commonly applied visual inspection of samples alone is insufficient to identify microplastic particles in environmental samples. This is especially the case for particles <500 µm, which have to be concentrated on filters for analysis. In this context, a spectroscopic verification of microplastic particles by micro-Raman or micro-FTIR spectroscopy is essential and has also been used successfully for analyzing marine samples. Spectroscopic techniques create an added value as they also provide information on the polymer composition. Although FTIR spectroscopy has been used more frequently in microplastics research (Hidalgo-Ruz et al. 2012) Raman spectroscopy is of equal value for analyzing microplastic samples. By combining spectroscopic techniques with fast area-resolved measurements, with e.g. FPA detectors, and chemical imaging, it is possible to scan whole sample filters in a fraction of time compared to chemical mapping with single detectors (Harrison et al. 2012). However, SOPs for the use of this highly promising novel techniques are not accessible at present but will soon be published (Löder et al. 2015). The standardized use of spectroscopy in microplastic research finally enables the generation of valid data on concentrations, particle size distribution, involved polymers and distribution among different marine habitats and in marine biota. This is essential to guarantee comparability of different data sets. Furthermore, the data generated will serve as basis for the design of realistic laboratory experiments on the impact of microplastics on marine biota. These steps are crucial for a reliable evaluation and the assessment of potential impacts and risks of microplastics in the world’s oceans. The authors would like to thank the German Federal Ministry of Education and Research (BMBF) and the Alfred-Wegener-Institut Helmholtz-Zentrum für Polar- und Meeresforschung (AWI) for funding the project MICROPLAST. Furthermore, we would like to thank the NLWKN for preparation and providing the microplastics samples for the case study and Dr. Sonja Oberbeckmann for providing the manta trawl picture. This is publication number 37791 of the Alfred-Wegener-Institut Helmholtz-Zentrum für Polar- und Meeresforschung.